Not even the light rain that fell early in the day could have dampened the happiness and joy that filled Saint Mary’s Church in Kidlington as Lucy and Chris became man and wife. I had worked with Chris previously on some commercial photography and, after watching my wedding photography business grow and blossom, he was more than ready to commission my services for his own wedding. Tears filled the eyes of mothers and fathers alike as the two finally exchanged vows after the childhood crushes of years gone by had turned to love. I was grateful to the priest who allowed me to photograph the ceremony from the rear of the church, which turned out to be a great vantage point considering the old world charm and simple traditional beauty of the old English church. The ceremony itself was extraordinary to watch as the emotional and enthusiastic priest poured his heart into his words. 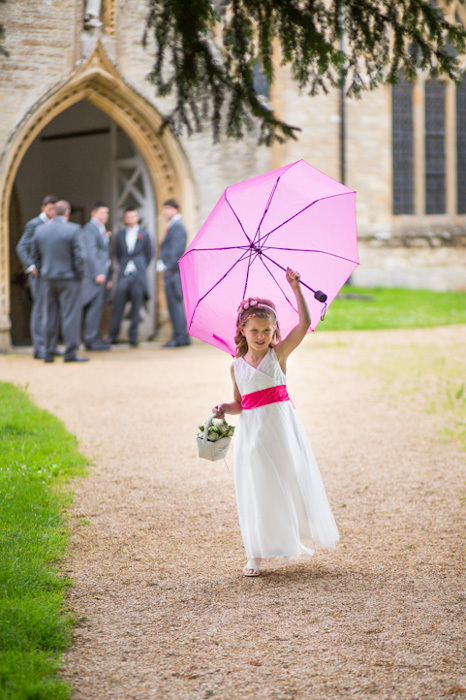 Oxfordshire wedding photographers take pride in not only photographing the beauty of a wedding celebration but also capturing the emotions of the wedding party members and sometimes even those of the priest or officiate. This wedding lent itself well to opportunities to do just that. The priest’s enthusiasm and the guests’ happiness for the couple showed through clearly in my natural wedding photography throughout the day. The reception was held in Abingdon, at the Milton Hill House, and afforded me ample backdrops for extraordinary wedding photography. The traditional look of the building along with its modern, stylish flair and rambling grounds provided many out-of-the-ordinary opportunities to capture the bride and groom and their guests in action. Outside in the garden, a fresh water fountain surrounded by highly manicured shrubbery, made a great foreground for some shots of the couple, offering a different look and feel from traditional wedding photography. Inside the house, there was a stunning ornamental stairwell with a private seating area at the bottom to be a great spot to accentuate the emotion of the day. The red Oriental rug against the deep, dark oak woodwork felt just perfect for some quiet shots of the bride and groom. I was proud to have been their Oxfordshire wedding photographer of choice for the ceremony of Lucy and Chris. It was a joy to be there, and I wish the two of them nothing but good fortune and a long and fruitful life together. Congratulations…and thank you!